• Accommodates most Literature Sizes. • In Stock ready for Immediate shipment. Display-World specializes in manufacturing a wide variety of quality acrylic display products for companies around the world. We pride ourselves in providing you with great products and superior customer service. And weve been doing it for over 25 years. Plus, with Display World, we guarantee your total satisfaction. In addition, we ensure your questions are answered, that ordering is easy and that the products we ship are the exact ones you need to help you sell more to your customers. 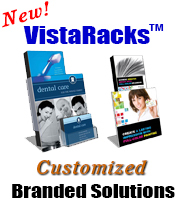 Offering hundreds of styles and sizes, we are here to make your promotional efforts simpler and more affordable. We also offer name, logo or message imprinting on most items. Need a custom size? No problem  let us know your needs. Want to hear from our satisfied clients? Be sure to see our Testimonials. Questions? Contact us today. Our dedicated product specialists are standing by. 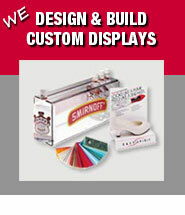 We look forward to helping you sell more with our wide selection of acrylic displays and merchandising solutions.